In what can be politely described as a 'strategic' tournament, the Mr. Cellan inspired Are You Lifting? upstarts stocked with Sophomores grinded their way through five rounds to stake their claim to the H. Frank Carey 2012 Dodgeball Championship. These Super Sophs (Andrew Ris, Joe Valli, Matt Robison, Dylan DeMeo, Erick Vilchez & Ray Catapano) and one Senior (Vin Cali) powered their way to the top defeating favorites (Super Friends & Prestige Worldwide) and upstarts (Trending Topics & Flint Tropics) before closing the deal in five games with an exciting title win over Marvel Alliance who were represented by four of last year's Champion members. The opening Wild Card round was highlighted by the first of three wins by the Fab Frosh team Hit It and Quit It whose future as a title contender looks bright. Meet the Browns brought some comedy as well as some loud vocal support from the crowd before bowing out gracefully. Sponsored by Modells took the tournament to the corporate level for the first time in its eleven year existence. The Sweet 16 round, much like the Wild Card round, went as predicted with the exception of one giant dragon slay as Super Friends with Benefits, the pre-tournament favorite, went down in flames as an army of underdog supporters rejoiced as they fell to Are You Lifting? The round also saw a gutsy one armed Harry Smith will his Just Dew It squad to their final win as these contending hopefuls fell in part to the damaging injury. With many of the underdog hopefuls separated from the pack early, 40-1 Flint Tropics became a new fan favorite as they stymied Pac Men in the final Sweet 16 game. Heading to the Elite 8, Marvel Alliance put Just Dew It to bed painfully quick. Hit It and Quit It quieted everybody's favorite talker Henry Bonilla :) and his 'Famous crew. Trending Topics fell to Are You Lifting and then immediately tweeted defeat before the Flint Tropics put the silencer on the Ron DMC Rock Box to round out the Final Four. In the Final Four Super Friends were missed so Marvel Alliance and Are You Lifting stretched their legs and muscled out two very game opponents in Hit It and Quit It and Flint Tropics who definitely will be teams to watch in the 2013 Tournament. And then...the Finals!, with Erick Vilchez destroying balls at an alarming rate as well as performing some acrobatic cartwheels. Vinny Cali waving the flag like Mel Gibson in The Patriot. Joe Valli, Matt Robison and Dylan DeMeo bringing fiery intensity. Ray Catapano providing gentlemanly play and M.V.P. 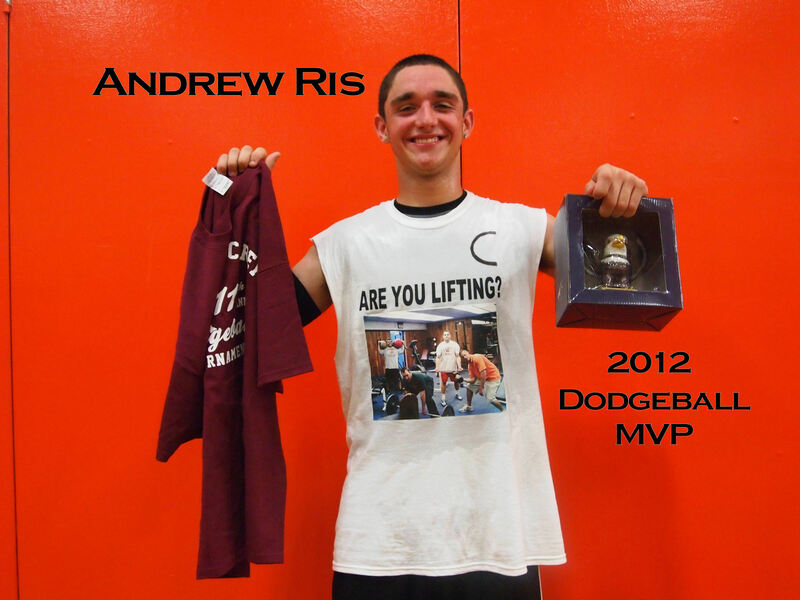 Andrew Ris acting as the consistent go-to-guy 'Lifting raced out to a 2-0 finals lead. But to their credit, Marvel Alliance and last year's MVP David Cedeno as well as the indefatigable Sonny "The Hulk" Catanese and Mike Masci bullied their way through two straight wins to set up the do or die elimination finale for both teams. In that final game the tank was finally empty for Alliance as 'Lifting slowly but surely picked off most of the superheroes before Ris put the final nail in the coffin to provide Mr. Cellan with a chuckle and a championship sponsored boast as his 'Lifting proteges allowed him to finally put down his RED rollbook!!! So let the bragging begin and thanks again to all of Carey student body for making Dodgeball a success! ******In closing, I must share this viewpoint without putting a damper on what has become the most fun day of the year, one that is greatly anticipated by students and teachers alike. As an observer, credit goes out to all of the Dodgeball competitors who were more polished in their approach to the game than ever before. Team strategies and philosophies were definitely evident as long hours of practice at Rath Park paid dividends for some teams as the desire for a student based Championship carries its weight in Gold. However, as the teams progress so must the Dodgeball Committee who were overwhelmed with slow play and "If you're not cheating, you're not trying" :) mantras that in fairness made this tournament the most difficult ever to officiate. Having said that the 2013 Tournament will have to take a serious look at adding Officials, consider going with an Orange Line Call, PERMANENTLY banning all players who curse aloud, slam walls and trash talk Etc., Penalize and Eject Cheaters that wait to be called out when they should do it VOLUNTARILY, and penalize those players who delay the action by holding the ball or letting it sit on the ground next to them for more than five seconds. It is an unfair and extremely boring strategy that, I believe, will sap the energy and excitement out of the overall tournament if not addressed. Best Team Name-Ron DMC and the Crew from Hollis, Meet the Browns and Are You Lifting? Best Uniforms-Pac Men, Sponsored by Modells, Are You Lifting? Other Thoughts-Special Thanks to Dan Fey for taking all the pictures, Sal "Taco Tuesday" Ciaccio for helping set up, Joe Babyer for guest DJ'ing and of course to Mrs. Angelillo, Mr. McLees, Mrs. Collins and Mr. Kenny for granting permission for the Tournament. Also a tremendous thanks to Head Custodian Steve Vitale and the rest of the custodial staff for getting the gym ready in time after a dividing wall issue. Best Moment of the Tournament-The 11th Consecutive Year Carey Students Showed How Awesome They Can Be By Behaving Perfectly!!!!!!!! Thanks from Mr. Hedquist. With such a major logjam of solid talent in the South bracket, I believe some really talented teams will be headed to the exits much earlier than anticipated. Teams like Are You Lifting, Prestige Worldwide, Ron DMC and even Super Friends if they get through their own bracket could make a run to glory but if they finished one and done I don't believe it would be a shock to anyone. In the North bracket, with all due respect, I believe its a two horse race between Marvel Alliance and Just Dew It to see who will head to the finals where anything can happen. I feel the other clubs in that bracket might get excited about a few wins before a dose of reality hits when they face one of the big boys. As for the rest of the South bracket, I believe the only dark horse candidate that could sneak through is Trending Topics if the so called powerhouses in that bracket run out of gas but I wouldn't count on it. Lastly, for what has to be the 500th time, I want to thank all of you in advance for participating in the 11th Annual Dodgeball Tournament. I want to thank you for assisting the baseball team in its fundraising ventures. I want to wish all of the Seniors best of luck in the future, and of course remind you once again that I DON'T CARE WHO WINS AND THAT MYSELF AND MR. SOTO ARE PROBABLY GOING TO MISS SOME CALLS. WE ARE DOING OUR BEST AND WE ARE NOT CHEATING YOU!!!!! :) Deal with it and overcome it if you are a true Dodgeball Champion. 3 to 1 or when DeSimone finally gets the cleat removed from his face!! 4 to 1 or when Harry leads the Pep Talk! 8 to 1 or when this team stops complaining about the bracket! 10 to 1 or when the rest of Ron's team figures out where Hollis is! 25 to 1 or when D. Murphy ever stops talking!!! 35 to 1 or when the entire Lucito clan is actually on the team! 35 to 1 or when Dan O'Connell doesn't wear a tank top! 40 to 1 or when Frank Sciacca doesn't change his team's name AGAIN! 50 to 1 or when Henry Bonilla actually beats Hedquist at Knockout!! 55 to 1 or when Zuvic isn't wearing his Ipod! 75 to 1 or when Modells actually pays for the team fee! 350 to 1 or when they get a new name! 400 to 1 or when Martians enter the Dodgeball Tournament! 500 to 1 or if the bird from Cocoa Puffs comes to life! South 9. Dirty Mike and the Boys Are You Lifting? 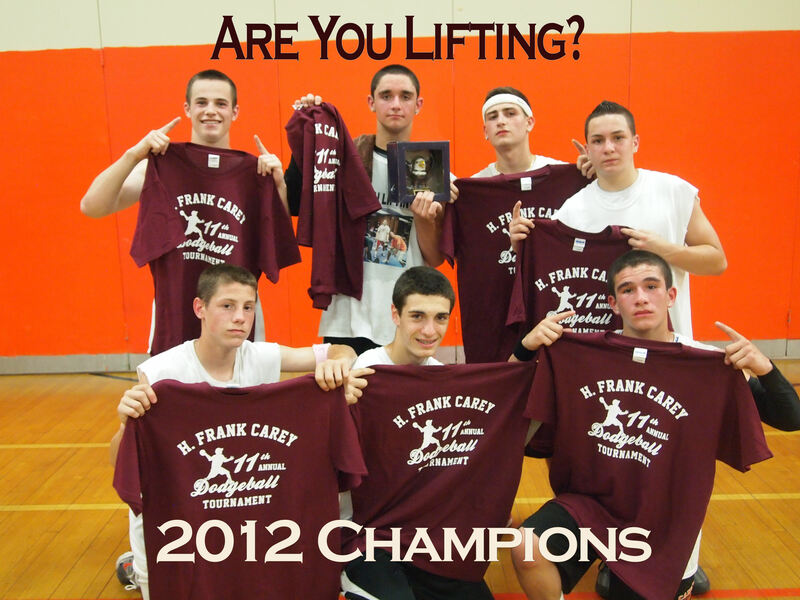 Prestige Worldwide 11 Are You Lifting? Are You Lifting? Are You Lifting?